The opening scene of the new Footloose is toe-tapping great and followed by the excellent addition of the game-changing car crash that sets the no-dancing law in motion. The last scene is even better- it had me on a glitter high and dancing in my seat. The iconic montage of Willard learning to dance to the tune of “Let’s Hear it For the Boy” is expertly copied almost frame-for-frame but given tiny modern tweaks and played with wonderful comic panache by Miles Teller. If they’d screwed up any of those three things (2 iconic, 1 tone-setting), the film would have had failure written all over it. As it is, a 70% mediocre film gets such a big boost from the excellence of that crucial 30%. When director/co-writer Craig Brewer took over the project from musical man Kenny Ortega, it went from a big screen staging of the super fun and not at all shallow Broadway musical to a fairly faithful retread of the hallowed ground of the original 1984 Kevin Bacon flick. I wasn’t a fan of the switch. The Bacon movie has aged incredibly well and didn’t need an update, but the underrated musical version might have been great fun to see. But Brewer got caught up in the idea of gritty realism or other such nonsense and ended up with a melodramatic copycat of what was a poignant and groundbreaking film once upon a time that never took itself too seriously. The new version kills off Ren’s mother Ethel before sending him from Boston, not Chicago, to the fictional town of dance-less Bomont, Tennesee (not Texas, an incredibly arbitrary distinction). Moving Ren’s hometown east allows for a few stupid jokes about “yankee sarcasm” but mostly serves to saddle the character with an insurmountably thick accent that makes him sound too rough and far too dumb (neither of which Ren actually is). The decision to kill of Ethel, on the other hand, makes sense to me. It simplifies the backstory while giving Ren a bit more license to be moody and substantially more emotional gravitas. It also puts Uncle Wes centre stage where the down-and-out mom used to be. In the hands of Ray McKinnon, Uncle Wes proves to be the surprise of the film, a wonderfully believable man torn between his ideals, his duty and his tradition. But unfortunately the great characterizations stop there. The charming and talented Julianne Hough does nothing to save the unrelentingly horrible character of Ariel (just as the less-deserving Lori Singer couldn’t in ’84) and a cardboard cutout that used to be Andie MacDowell simply delivers lines instead of even trying to capture the quiet turmoil Dianne Wiest brought to the preacher’s wife role. Dennis Quaid does an admirable job as said preacher, well-intentioned but over-protective dad being the best of his modes. But, like MacDowell up against Wiest, he just stood absolutely no chance of owning that role when John Lithgow was so perfectly empathetic and commanding in it. Teller is a great Willard, ever endearing and fantastically funny, and Ziah Colon is wonderfully plucky in Sarah Jessica Parker’s old role of Rusty. There was absolutely no point to Ser’Darius Blain’s character Woody, a random third friend added to Ren and Willard’s duo, apparently to add some sort of hip hop groove to counter balance Willard’s country flair. It didn’t work. Oh, and he was in the cheering section for a completely bogus “re-interpretation” of the famous chicken scene that involved over-decorated school buses and a figure eight race track. In case you were wondering, that did not work either. And as for the leading man, recommended by Timberlake himself (apparently he danced on his tour). 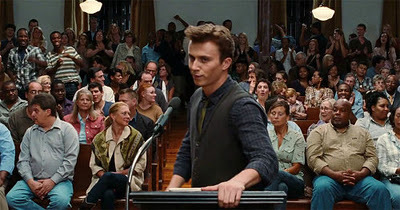 Kenny Wormald, a Massachusetts native, has the slight accent, but the extent to which it’s brought out in the film makes it very hard to get into some of his more dramatic scenes. He sounds like a parody and it’s just not okay (especially in contrast to the altogether subtle accents of the Bomont natives, a complete shock). He does what he can but the kid’s not an actor and it shows. 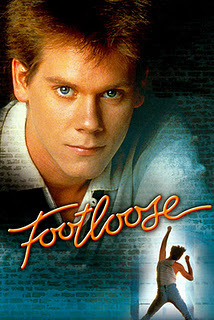 But he’s not an actor, and that can only mean one thing in Footloose– he’s a dancer. And boy, silliness of the “angry dance” aside, the secret to Ren’s sexiness really is in the dance moves. Thank god he’s the strong and silent type because when Wormald shuts up and shows off just how great of a dancer he is you can’t help but see what Ariel sees. His expert physical performance extends from line dancing to the angry dance’s famous jumps and spins to his fight scenes to his and Hough’s sunset-backed first kiss. His modernized retro 80s style is kind of cool and I do appreciate the maroon blazer (and Ariel’s pink dress) as shoutouts to the original costumes, but the Edward Cullen hair was a mistake. As a leading man in general I’m not sure Wormald is set for stardom (the two big name dropouts from the role- Zac Efron and Chace Crawford- would probably have fared better), but there’s something to be said for a Ren who’s leading the fight for the right to dance without a body double. The new Footloose is uninspired and repetitive. The few innovations they brought to the old film fall mostly flat and many of the elements they kept (down to entire lines of dialogue lifted straight from the original script) just can’t measure up. But Footloose is just so much fun! And both the original film and the musical adaptation hold a special place in my heart- some of my best highschool memories revolve around a production of the show. This film isn’t a remake that belittles the legacy of the original, more than anything it’s a tribute to its 1984 incarnation. And even if I didn’t love the whole thing, the perfectly designed first scene pulled me in from the word go, the iconic Willard montage reminded me why I was there and the jolt of nostalgic adrenaline that is the ending sent me out of the theatre loving the film. Even if my head said no, my feet were dancing all the way home.